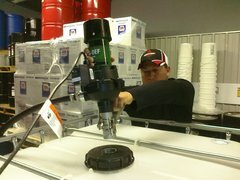 In most installations Brown's Oil Service will furnish a fuel tank and pump at no additional charge to the customer. 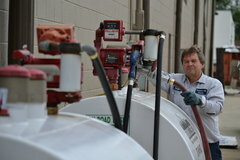 Find out if your company will qualify for a tank installation that will save you time and money. 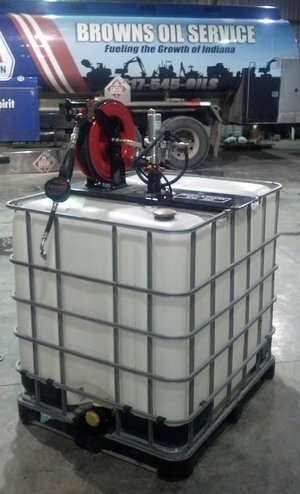 Our mobile fuel tank is very popular with the construction industry. This setup is great to fuel equipment in those hard to reach areas. You can utilize this tank on a jobsite and pull it around with a pickup truck or small dozer with a pintle hitch. 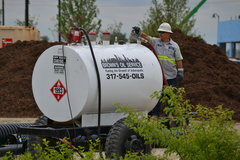 Skid tanks are very handy if you are a contractor on a jobsite or a landscaper with a small fleet of trucks. Skid tanks are available with a 110 volt pump and meter or a 12 Volt system for remote areas when 110 power is not available. Tank sizes range from 550 gallons to 2000 gallon tanks. For the larger fleets, talk to Brown's Oil Service about purchasing your fuel by the transport load. We have the ability to delivery product up to 8500 gallons at a time and offer fueling system between 6000 and 12000 gallon setups. 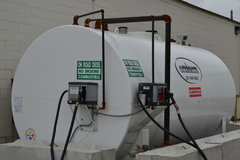 Pictured to the left is a 6000 gallon dual wall tank with a key reader fuel management system. 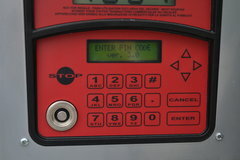 Talk to a representative at Brown's Oil Service today, about one of our new fuel key readers. You can monitor your fuel usage by driver, truck number, time, date and type of product. Information from the pump is then downloaded right to your office computer in just a few seconds. Once you have the data on your computer, you can then run fuel reports in detail. See if your company will qaulify for a furnished key reader system.